Rich and fudge-like, these gluten-free chocolate cookies are incredibly easy to make and bake up in no time. You’re going to want to add this gluten-free cookie recipe to your to-make list. 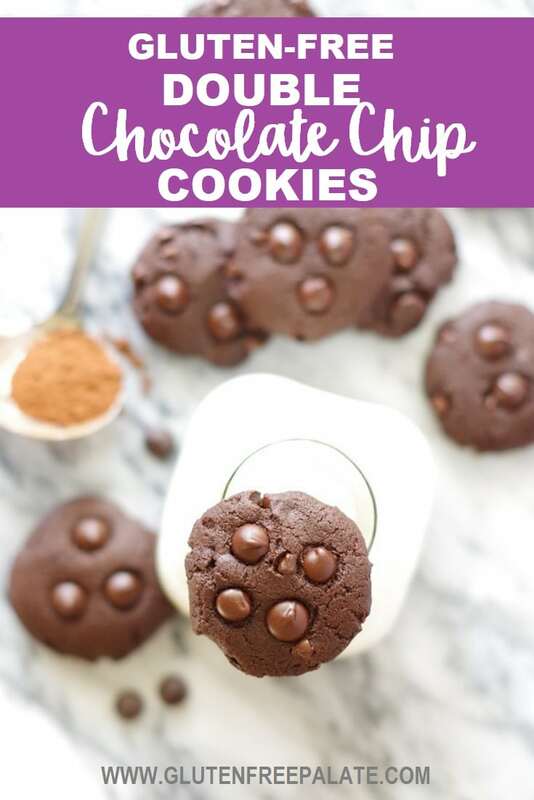 This gluten-free chocolate cookie recipe is super easy to make and will beat out any gluten-free chocolate chip cookie recipes because they are essentially a gluten-free chocolate chip cookie with extra chocolate. 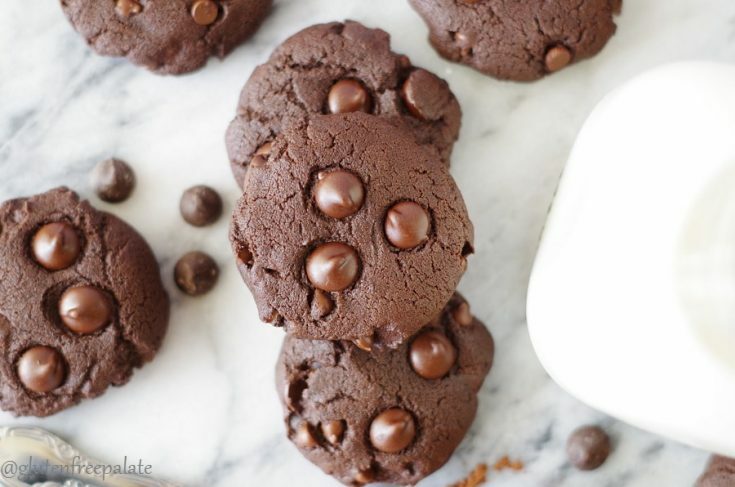 This gluten-free cookie is full of cocoa and chocolate chips making is a favorite. If you are a cookie monster like me you’re going to want to check out my Gluten-Free Oatmeal Chocolate Chip Cookies and my Gluten-Free Peanut Butter Chocolate Chip Cookies. 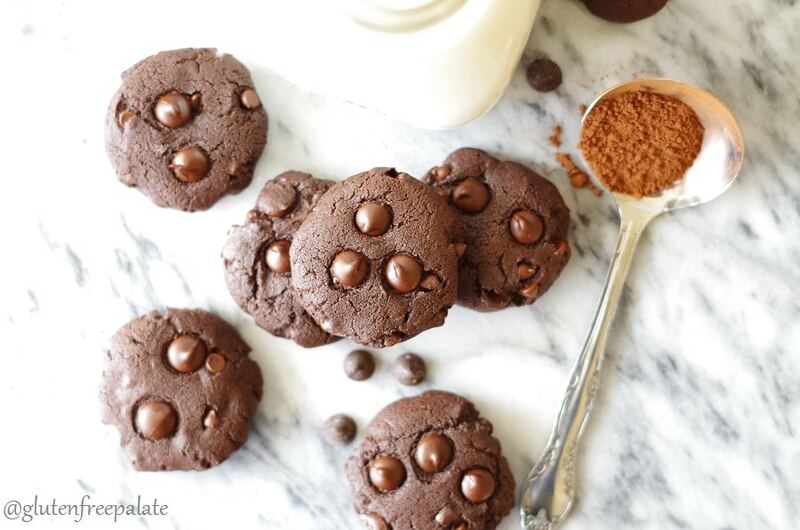 Everyone loves gluten-free chocolate cookies! If you’re anything like me, and you love chocolate and gluten-free cookies, you’re going to love this gluten-free cookie recipe. They don’t have a ton of sugar in them, like a lot of cookies, and they are fudge like. 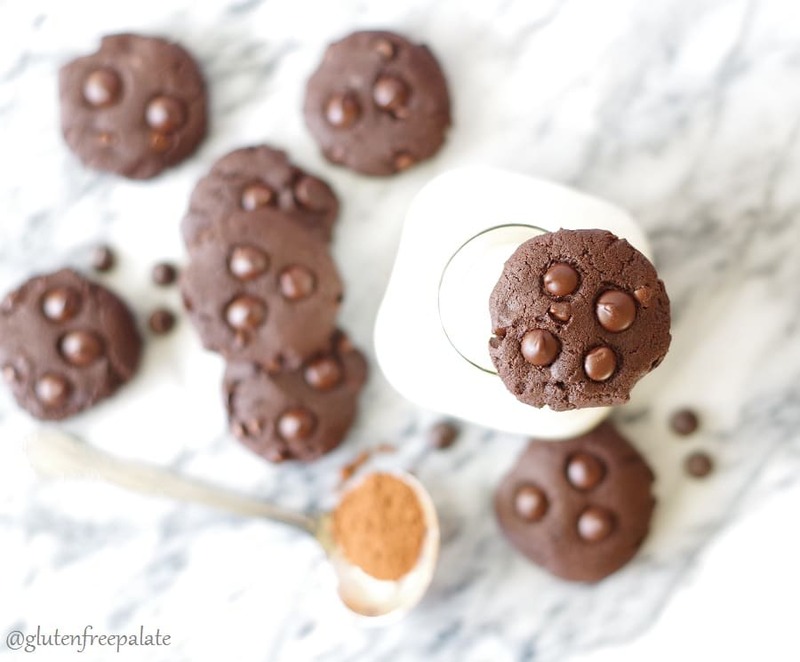 The addition of the gluten-free, dairy-free chocolate chips makes these cookies gluten-free chocolate cookies extra chocolaty. And I can’t turn down a chocolate anything. These gluten-free cookies remind me of a brownie mixed with chocolate cake. They have this soft, but chewy texture and they are rich without being too sweet. My girls are my official taste-testers and they said these gluten-free cookies are perfect. They asked to take a gluten-free chocolate cookies each day in their lunch and convinced me to make two more batches so they could share with their friends at the bus stop. Anytime they ask me to make extras to share I know I have a winning recipe. We packaged these gluten-free chocolate chip cookies up in groups of four, and tied a ribbon around them and handed them out to all the friends. These Gluten-Free Chocolate cookies earned starred reviews from everyone who had the chance to try them. They are seriously a scrumptious gluten-free cookie. Can I use dairy butter in gluten-free cookies? Yes, you can swap the dairy-free butter our with regular dairy butter in this gluten-free cookie recipe. It yield’s the same delicious results as regular gluten-free chocolate chip cookies. Read the recipe instructions carefully and make sure you have all ingredients on hand. If a gluten-free cookie recipe calls for ingredients at room temperature, try to make sure you use room temperature ingredients. Make the gluten-free cookies as directed before experimenting with substitutions, unless substitutions are provided. For example, I’ve used dairy-free ingredients in this gluten-free chocolate cookies but I haven’t tried them with an egg substitute yet. 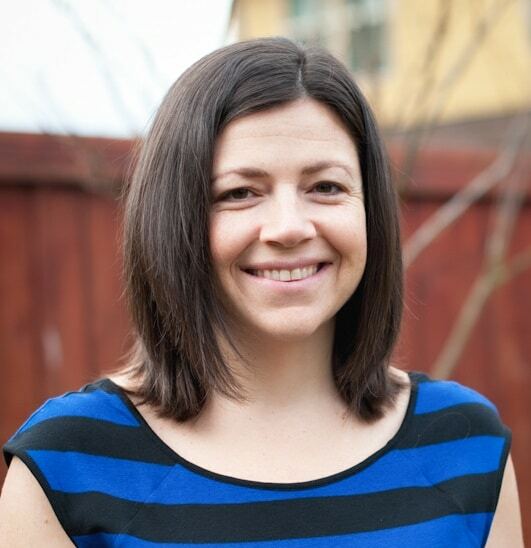 Measure and weight ingredients, don’t eye-ball the measurements. Start with the lowest baking time and watch for doneness. Preheat your oven. Line three cookie sheets with parchment paper; set aside. 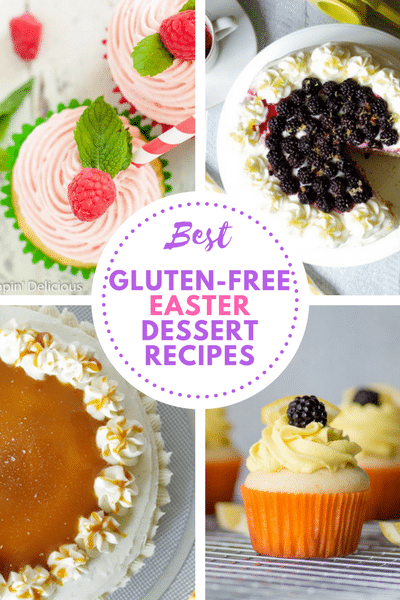 Making gluten-free cookies has never been easier! For the full instructions and ingredients for this gluten-free chocolate cookie recipe see the recipe card below. What gluten-free flours can I use to make gluten-free cookies? 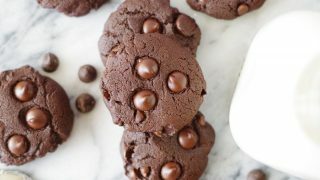 For this gluten-free chocolate cookie recipe you can use Ryze gluten-free flour, Bob’s Red Mill 1-to-1 Gluten-Free Flour, or my gluten-free flour blend. The one downside to sharing with your friends at the bus stop is the start to expect treats each week. Now I feel like I have to make double of everything so we can share. We do love to share, and we love showing people how easy and tasty this gluten-free cookie recipe can be. Did oy make these gluten-free chocolate cookies? Please let me know what you thought by leaving a starred review and a comment below. It helps others know how amazing this gluten-free cookie recipe is. Super simple gluten-free double chocolate chip cookies that will make any gluten-free cookie lover swoon. Double the chocolate double the fun and yum! I can just tell by these pics that the texture of these cookies are on point! brownie + chocolate cake consistency in cookie form is where its at! Love that these are secretly healthified! Everything about these cookies sound amazing! I will definitely need to make a batch of these soon. Whenever I bake I always give some away or else I will eat it all, which is funny because now it’s a given if there is something sweet on my insta and we are meeting you will most likely get some! Yum! 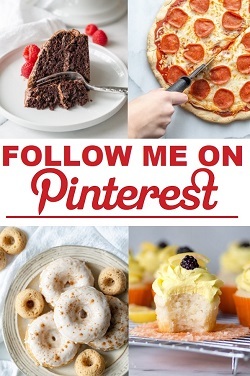 These look delicious, hubby’s the chocolate eater at our house, I’ll have to make these for him! You can never have too much chocolate! What a great recipe this is! Can I use oat flour instead? If so, is it the same amount? I haven’t tried oat flour in these yet. Sorry it took so long for me to get back to you, I was on vacation.